A smartphone that was lost in South Korea has apparently surfaced in Pyongyang. 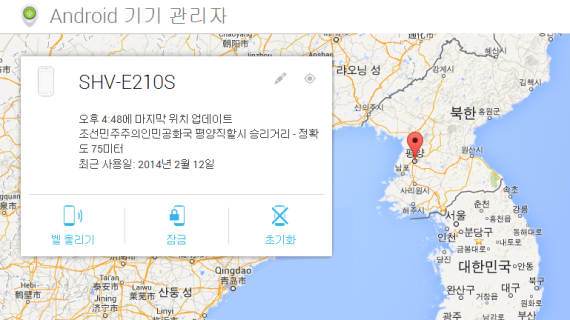 A South Korean Internet used posted a screenshot from Google’s Android Device Manager that shows the phone on Sungri Street (????) in Pyongyang. The page says the location accuracy is 75 meters. Curtis Melvin, author of North Korea Economy Watch and authority on places in the DPRK, told me Sungri Street runs through the central district in Pyongyang. It’s marked on Google Maps and is the road that dissects Kim Il Sung Square. It hasn’t been possible to verify the story, but the SHV-E210S is the model name of a Samsung Galaxy S III variant that is sold in South Korea. What’s perhaps most interesting is that the Android Device Manager can find the handset because a typical North Korean cell phone or WiFi connection doesn’t have Internet access. The phone is compatible with the WCMDA phone network technology used by Koryolink so it could be on the cellular network or it could be connected via WiFi. To be on the cellular network, it would have to be fitted with a local SIM card. Or the whole thing could be fake. 2 Comments on "Lost phone found in Pyongyang?" I thought that North Korean internet is cut off from the rest of the world. If so, the phone would not be able do send its location to Google. Would it be possible to get the link to the South Korean website?